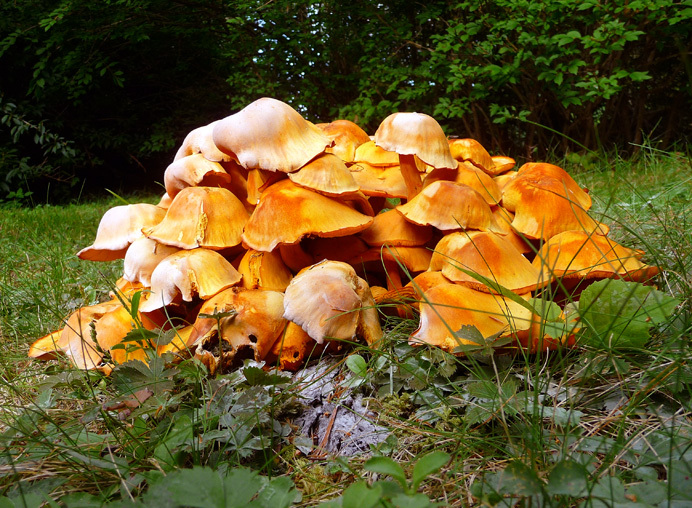 A clump of orange mushrooms, each with an umbel the size of a small pancake, has suddenly appeared behind a stand of spruce trees along Round Hill Drive. The gray dust in the foreground is probably the mushroom's spores. I haven't had time to identify the species, but these look like what we used to call "chicken mushrooms" at my boyhood home in Pennsylvania. They were not only edible, but highly prized. If you recognize them, please .